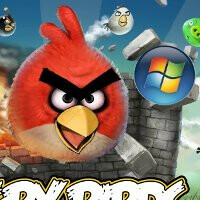 Windows Phone 7 owners are no doubt curious as to what Microsoft will show off come May 24th, but equally so, we’re sure that many are excited to finally get their game on with Rovio’s immensely popular Angry Birds game. Without question, some Windows Phone 7 users will be bummed out by the news, but considering the story behind Angry Bird’s past flirtation with the platform, what’s another month going to do? whyyyyyyyyyyyyyyyyyy whywhywhywhy just release it now and give an update later!!!!!!!!!!!! They need the extra month to update the title screen to read "Angry Birds 2009".